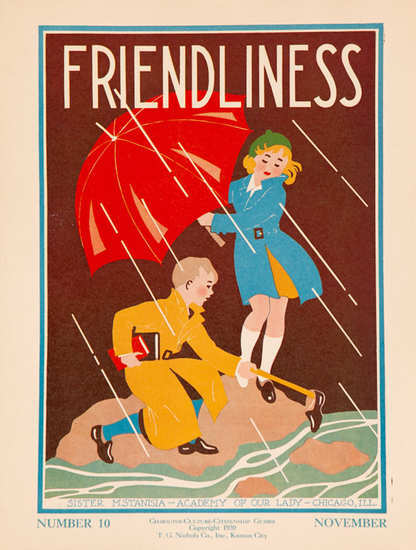 Character-Culture-Citizenship Guides 10 - Friendliness. I love this Character-Culture-Citizenship Guide, the colors and the coats are outstanding, but there are a few things I noticed: 1) How do you lose a shoe in a river? 2) These people are trapped on a rock during a rain storm, they have bigger problems than a lost shoe. And why friendliness? Wouldn't this be more of an illustration for Helpfulness...or even Foolhardiness, if indeed he's pulling a shoe out of a raging river during a flood? But you're right. The colors are wonderful.